This kind of plate sits directly on top of the concrete foundation. This framing member generally has some sort of gasket between the plate and the top of the foundation wall. The largest of Earth's tectonic plates is labeled "N" on the map. What is the name of this plate? Where is a fork positioned in relation to the dinner plate? Where is a knife positioned in relation to a dinner plate? The map shows the major tectonic plates. Which plate is NOT associated with the Ring of Fire? How is the butter knife placed in relation to the bread plate? Write the letter from the tectonic plate map that matches the name of each plate. The outer layer of Earth is broken into large pieces. These pieces are called plates. The map shows Earth's major plates. The Pacific Plate is surrounded by a ring of volcanoes. Based on this information, where are volcanoes most likely to form? Plates coming together are plates. Earth's crust and upper mantle are broken into several . an oceanic plate slides underneath a continental plate. a continental plate collides with another continental plate. boundary between Earth's outermost layer (crust) and the mantle. layer of Earth surrounding the inner core. one of the moving, irregularly shaped slabs that make up Earth's lithosphere. Which of the following is NOT a type of collision for convergent plates? Where are volcanoes and earthquakes located and is there a relationship between them? 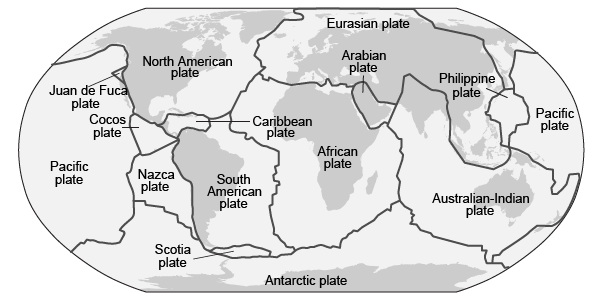 The largest lithospheric plate is the Eurasian Plate. Plates passing each other are plates. The Andes Mountain Range and Andean Volcanic Belt line the western side of South America. Based on this information and the map, which statement best describes the plate boundary interaction along the west coast of South America? The Nazca plate is subducting under the South American plate. The South American plate is subducting under the Nazca plate. The Nazca plate and South American plate interact along a transform boundary. 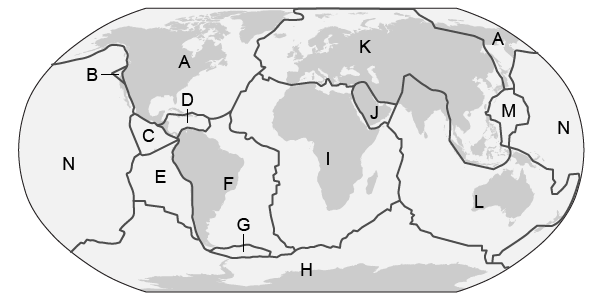 The South American plate and Nazca plate interact along a divergent boundary.